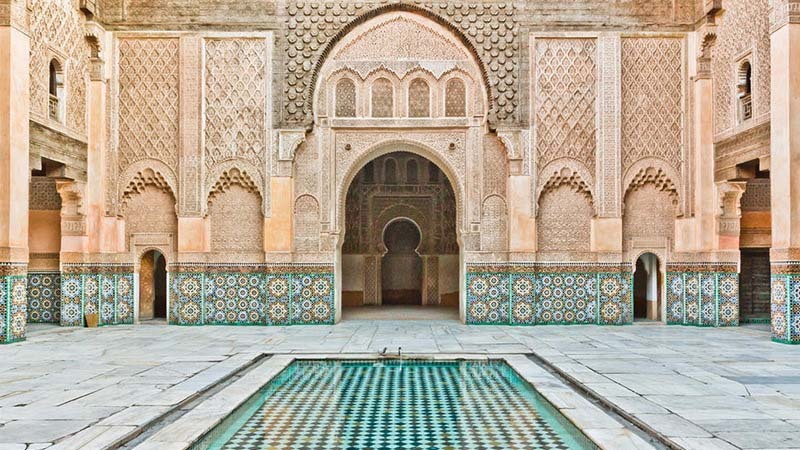 Our Morocco Adventure has sold out in 48 hours three years in a row now, and for good reason. We expect it to fill quickly again this year because it’s truly a trip of a lifetime on so many levels. A one of a kind experience throughout the best of this stunning & diverse country, our Morocco group tours will take us from the beautiful Mediterranean port city of Tangier, to Fes (known as the “Athens of Africa”), along the stunning Atlas Mountain Range, to a luxury tented camp in the world famous Erg Chebbi desert, onto unique gorges & landscapes ripe for photography, & finishing in the imperial oasis of Marrakesh. Lots of amazing photography stops will be made throughout the journey and, as always, we’ve designed some really unique, off the path experiences. Check out all the highlights below and E-mail us at joinus@photoflytravel.com for the daily itinerary! 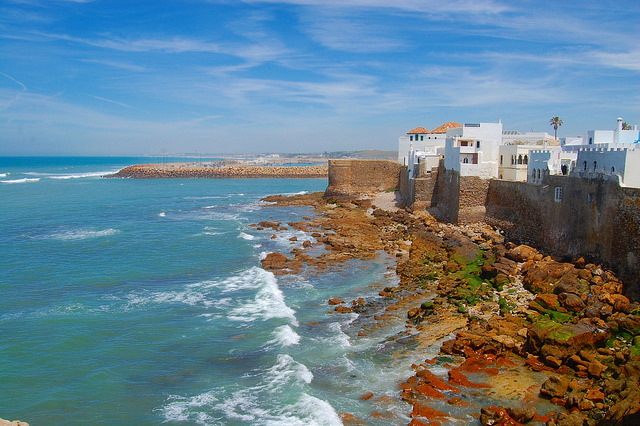 At the cross-roads of Europe & Africa and of the Atlantic & the Mediterranean, Tangier opens the door into Morocco. There is still an air of mystery about the city, going back over 2,000 years to the the time of the Phoenicians, and after WWII when it was made into an international zone attracting eccentric expats, colorful artists & hippies, and even spies! “Tangier the white”, the star of many films, the city of many stars – The city you fall in love with. – Mountain Road Trip: Pass splendid villas & gardens en route to Cape Spartel and it’s striking lighthouse. Great views & photographs from this north-westerly point of Africa. – Hercules Cave: Continually inhabited since the Neolithic period, we’ll visit the place where legend has it that the great Greek God rested after separating Gibraltar from Africa! Chefchaouen is an otherworldly escape nestled in Morocco’s Rif Mountains and founded in 1471 by Moorish exiles from southern Spain. This small town has a rich history, beautiful natural surroundings, and wonderful architecture. 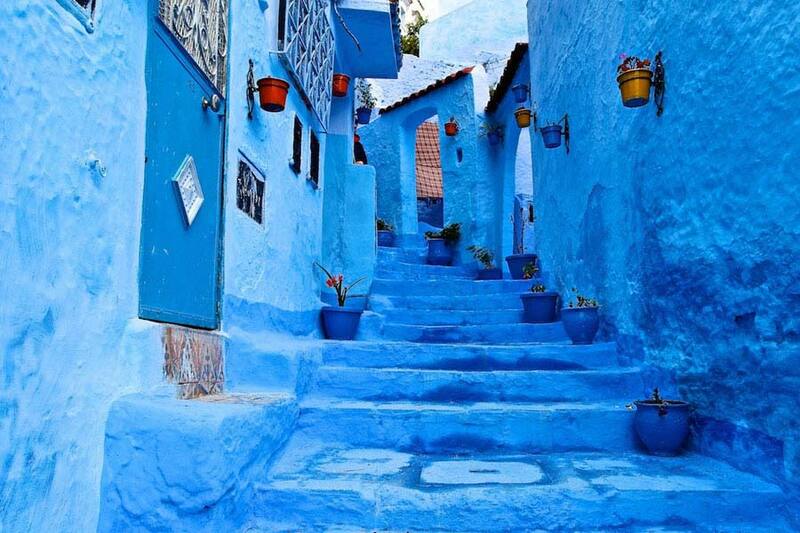 Known as the “blue” city due to its picturesque blue-glazed houses & buildings, they are a tradition that comes from the town’s former Jewish population. Andalusian Morocco: En route to Chefchaouen we’ll stop in Tetouan, known as the center of Andalusian Morocco. The city is famous as the place Spanish Jews came to settle after they were expelled from Southern Spain (Andalucia) along with the Arabs in 1492. 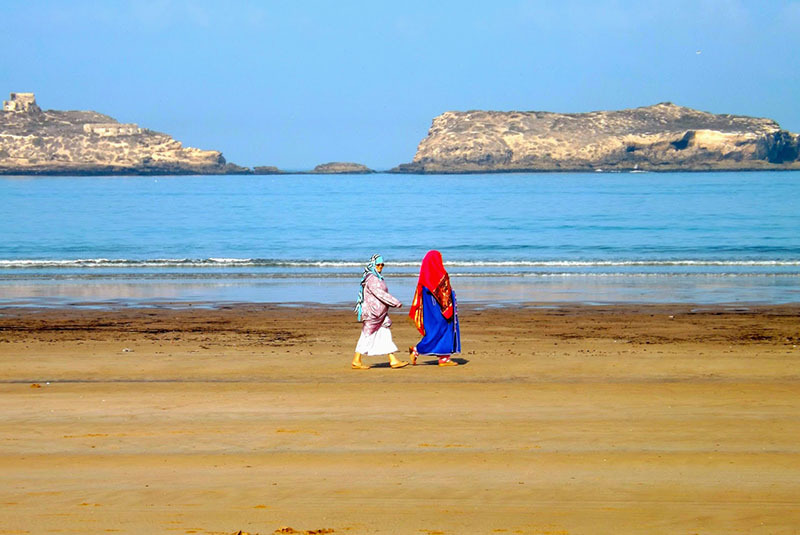 We’ll explore the fascinating & authentic Medina which makes up the heart of the city while its nearby beaches are popular with both locals and visitors. 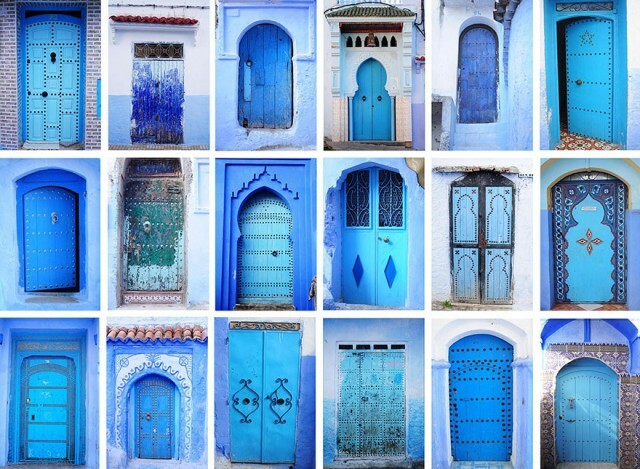 – There is amazing photography through the unique, hilly city of Chefchaouen! Wander around and photograph the Kasbah, the Medina, Jewish Quarter, Berber Souk (open air market), and the Artisan Quarters. Get lost in the beauty on your own or follow our guide to the hidden corners for awesome shots. – Check out and buy native handicrafts not available anywhere else in Morocco, such as wool garments and hand woven blankets with intricate embroidery. The goat cheese native to the area is also delicious & a must try. Leaving Chefchaouen en route to Fes, we’ll spend the morning exploring the UNESCO World Heritage site, 2000-year-old Roman ruins of Volubilis and get a picture of life (pun intended) during the Roman Empire. Our local guide will tell us about life in this well preserved Roman city as we peer into old bathhouses, marveling at the still-present mosaic floors, and gazing up at towering marble pillars. Two UNESCO World Heritage sites for the price of one this morning with another stop in the 17th century imperial city of Meknes. 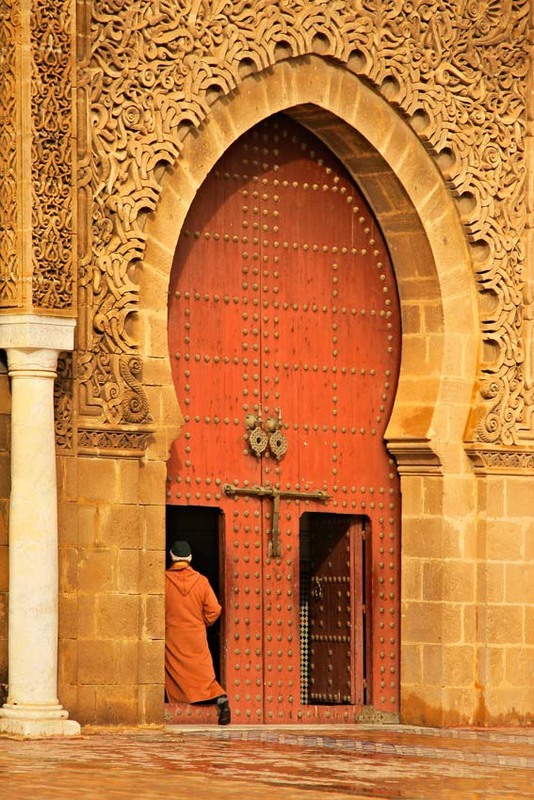 In the old Meknes medina we visit Bab el Mansour, the grandest of all imperial Moroccan gateways. We continue our tour to the small but impressive Mausoleum of Moulay Ismail. Next we pass by the entrance of Meknes Royal Palace and end up at Moulay Ismail’s massive Heri es Souani, his personal stable & granary for his 12,000 horses. One of the largest medieval cities in the world and an UNESCO World Heritage site, Fes is Morocco’s oldest imperial city and the religious, spiritual, intellectual, and cultural center of the country. – Guided City Walk: Considered the “Athens of Africa” for its wealth of cultural, educational, and religious institutions, the walk begins at Fes’ fascinating medina, with stops to see and photograph the artisans’ quarters, 14th-century Koranic schools, Al Karaouine (medieval theological university), and the Potters District. 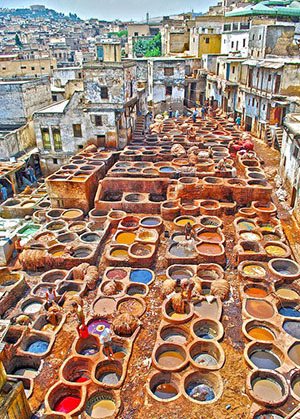 The famous Fes tannery affords us great panoramic views over the men hard at work treating and dying the different hides. After lunch, head to the old Mellah (Jewish quarter) and its 17th century synagogue, royal gates, and Museum of Fez. – Unique Family Dinner in Traditional Home: Located in the heart of the Medina, we’ll enjoy a very special experience dining at a traditional house with a host family for a truly authentic glimpse into the lives and culture of the Moroccan people. Ask about their way of life, values, interests, etc and share with them ours! Not to mention, the houses traditional Moroccan Fessi architecture will be the perfect place to photograph & enjoy an incredible home cooked meal in the most authentic way possible. No better way to wrap up an adventurous day around the city! 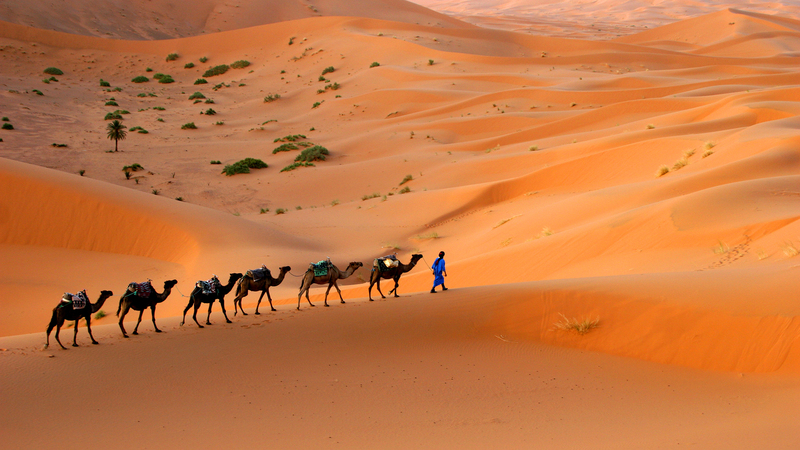 Referred to as the “Gate of the Sahara”, Erfoud is perched on the edge of the Erg Chebbi – a 30 mile long and 3 mile wide set of sand dunes that reach up to 170 ft high, some of the highest in North Africa! En-route to this magical place we’ll be stopping at numerous points for awesome photographs. 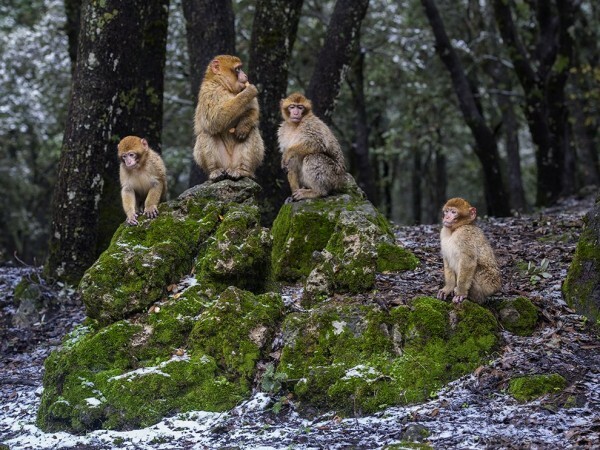 – Ifrane, the Swiss Alps of Morocco: This small mountain town located at an altitude of 6,000 ft above sea level is unlike any other city in Morocco with heavy European influence. The town shows off its buildings with neat, red roofs, blossoming gardens, lakes, parks, lush vegetation, pine forests, and snowy winters. – Scenic Cedar Forest & Barbery Apes: We’ll drive through and stop to photograph a beautiful cedar forest and encounter a tribe of “apes”. These close relatives are actually a species of unique macaque monkeys which are the only ones found outside of Asia and have an extremely small tail. Our desert camp is the perfect place to enjoy a magical night in the desert under the stars. All luxury tents at the camp have air conditioning, en suite bathrooms w/ showers, and are beautifully decorated in the local Berber style. 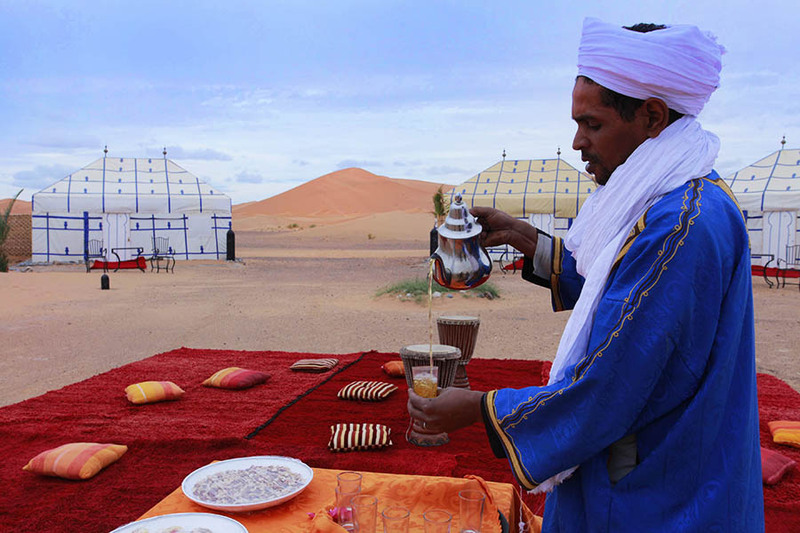 A large “dining room” tent will be the perfect meeting place for a delicious home cooked Moroccan feast. The center of the camp lights up at night with fires perfect for keeping warm while stargazing. Walk just a few feet away for absolute darkness for epic night shooting! – Camel ride into the desert: We’ll hop on camels at the edge of the desert and be guided to our luxury desert camp for an amazing sunset, Moroccan home cooked feast, & night under the stars! – Enjoy and photograph sunrise the next day before a specially prepared Berber breakfast and make our way back to Erfoud, famous for it’s date festival and ancient fossils. This remote town is sought after for it’s proximity to the stunning Dades Gorges & Valleys. Famous for it’s majestic, sand castle like rock formations, Dades Gorge offers a plethora of unique landscape shots. At 28 km long , the gorge is diverse in scenery with countless types of interesting & unusual geological formations. It’s set among a beautiful landscape with berber villages & plantations along the Dades River culminating in a deep, dramatic canyon. 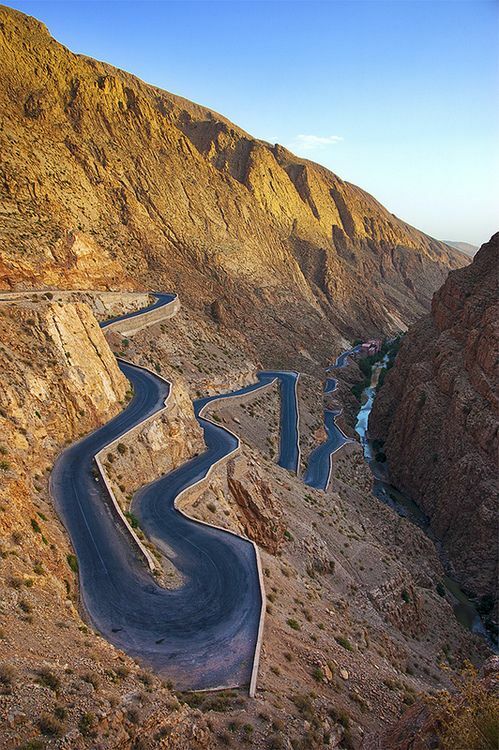 – The Route of 1000 Kasbahs: En route to Boumalne Dades we’ll have en epic road trip along one of the most beautiful drives in the entire country. The “Route of 1000 Kasbahs” as it’s commonly referred, is dotted with oases, ksours (fortified Berber villages), & of course lots of Kasbahs, or fortified homes of the ruling families. 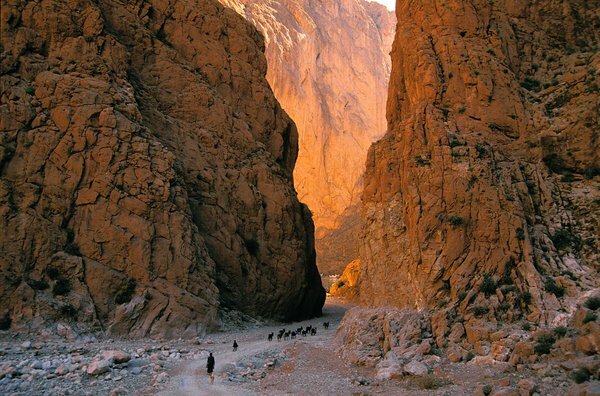 It continues up into the High Atlas Mountain range full of the highest and narrowest gorges in northern Africa. – Tinghir: We’ll stop at this old French fortification which used to be the base of the French Legion Army that controlled the southern tribes and roads. Today, the small city is at the center of one of the most beautiful oases in southern Morocco. We’ll walk through flowered gardens, ksours, and Kasbahs, then onto the Todre Gorge. – Todra Gorge: Lush palm trees cover 30 miles of wide tracts along this giant natural creation. We’ll walk among the palm and olive groves to the deep & narrow canyon of pink and grey rock towering 1,000 ft high on each side. all sorts of interesting formations. One of the more well known is called “Monkey Toes”, a mountain ridge formation of rocks that have been eroded by wind and water into smooth toe like formations which intertwine in beautiful patterns. Over 150 species of birds can be found within the valley attracted by the Dades River and surrounding vegetation. Quaint, Berber villages dot the valley as we hike through to the dramatic canyon with lots of date and fig fields tended for centuries. – The Rose City: Stop in Kalaa M’Gouna in the heart of the Dades Valley, famous for its rose plantations. It’s home to the country’s largest rose water and rose oil manufacturers. – Ait Ben Haddou: On our way to Marrakesh we’ll visit this world famous Ksar (fortified village), now an UNESCO World Heritage site. 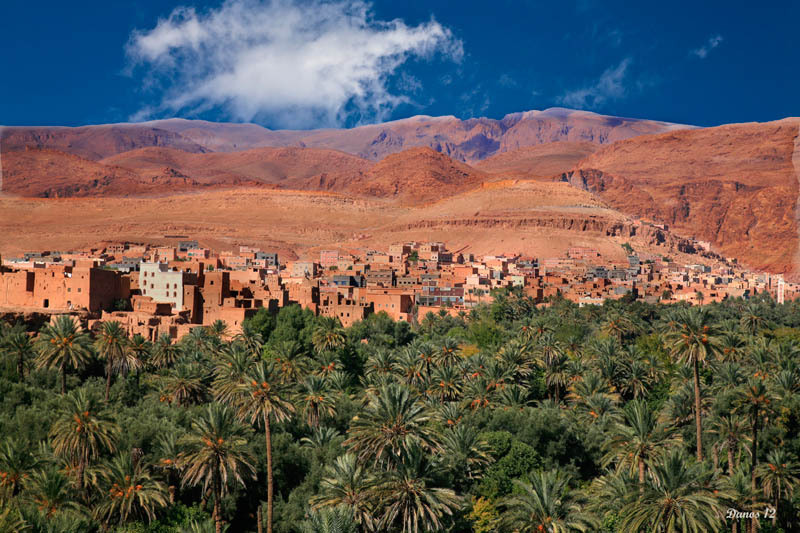 A traditional Mud Brick city on the edge of the High Atlas Mountains, many classic & modern movies have been filmed here including Jewel of the Nile, Cleopatra, Lawrence of Arabia, Gladiator, Seven Years in Tibet, Game of Thrones, and The Mummy (just to name a few…). Once the southern capital, the “The Red City of Morocco” is an alluring oasis with a temperate climate, distinct charm, and fascinating sights in every direction. Referred to as “The Jewel of the South”, the city reached its prominence when it became the epicenter of trade for slaves, gold, ivory, and leather along the ancient caravan routes. 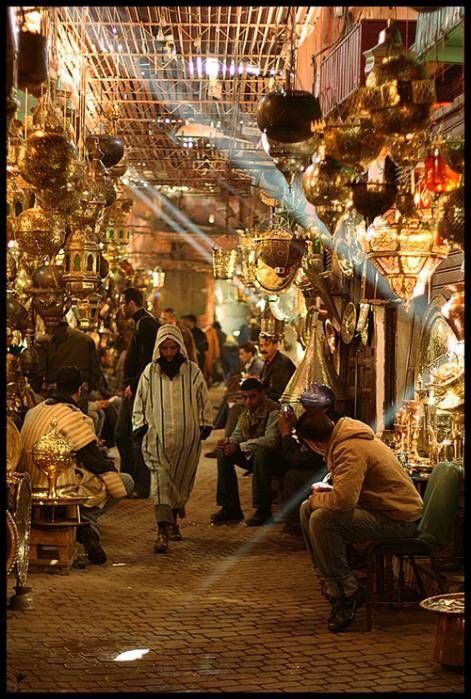 The medina is a densely packed, walled medieval city dating to the Berber Empire with maze-like alleys where thriving souks (marketplaces) still sell traditional textiles, pottery, and jewelry. In other words, get those cameras ready! – Marvel at the Bahia Palace: With its lush, Moorish style gardens, the structure was erected by the countries top artisans in the 19th century to be the greatest palace of its time. “Bahia” literally means “brilliance” and is a true nod to the beauty of traditional Moroccan architecture. Gilded woodwork ceilings of the stunning grand and petit courts, & the sultans “harem” rooms with silk panels, stained-glass windows, & intricate marquetry where his wives & concubines lived are just a couple highlights of the 150 rooms which make up the palace. 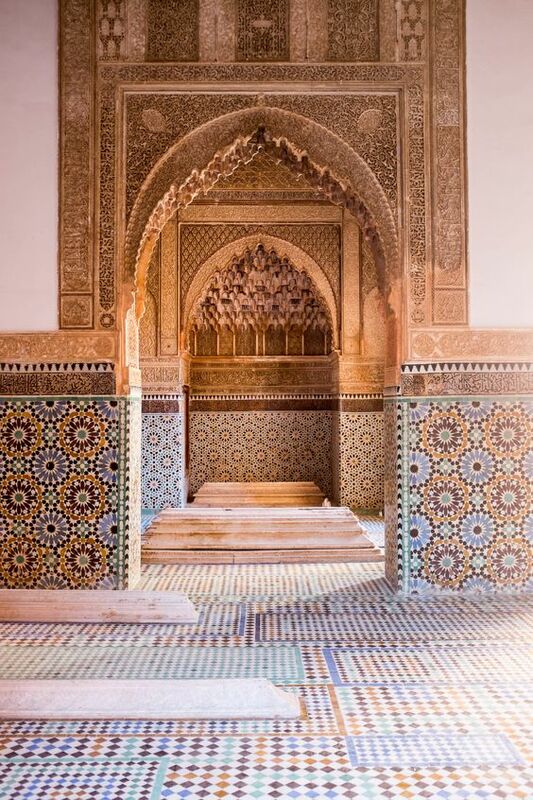 – Explore the Saadian Tombs: Discovered in 1917, the tombs date back to the late 1500’s during the reign of the sultan Ahmad al-Mansur who spared no expense creating his glamorous resting place. Three rooms make up the tomb with the most elaborate known as “The Chamber of the 12 Pillars”. The stele (columns) are made up of finely worked cedar wood & decorative stucco & the monuments are made of imported Italian Carrara marble. – Koutoubia Minaret and gardens: With perhaps the most stunning minaret in the country, this mosque is the largest in Marrakesh and a great site to photograph. The minaret acts as a reference for almohad style architecture, is made of sandstone, and stands 250 ft tall. – Majorelle Botanical Gardens: A truly enchanting place, the gardens were designed by French painter Jacques Majorelle over the course of 40 years and are reminiscent of the famous Generalife gardens in Granada, Spain. 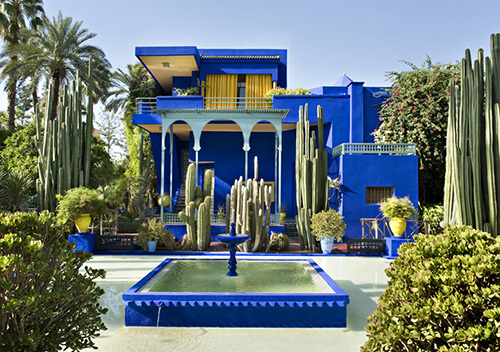 The special shade of bold cobalt blue which he used extensively in the garden and its buildings is named after him, “Majorelle Blu”. – Dar Si Said Museum: A solid exhibition of historic and contemporary Moroccan art housed i n a gorgeous palace. The building itself is full of intricate Byzantine designs and colors. 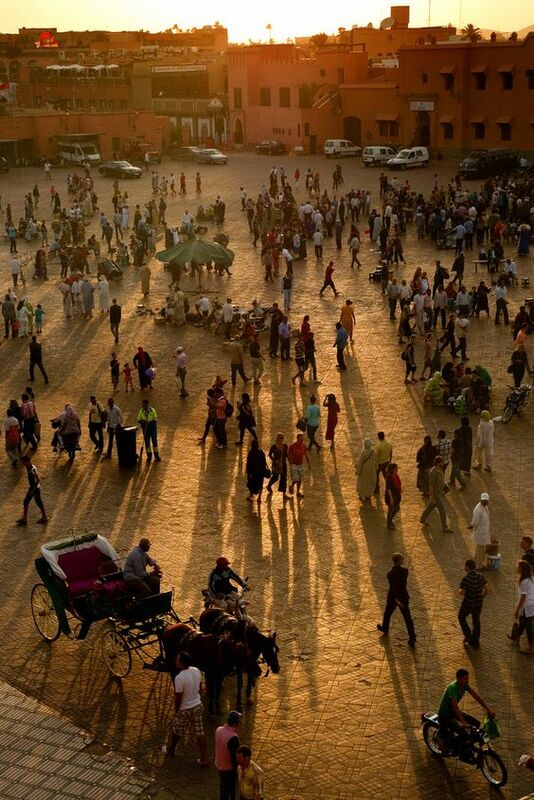 – Jemaa el Fna Square: Wander around and photograph this UNESCO site and the heart of Marrakech. Jemma means “congregation” and the square does not disappoint as an entertainment hub for locals and tourists alike. At the end of the afternoon, storytellers, snake charmers, tooth-drawers, and dancers compete to entertain the crowd in a scene you’ll have to photograph and bring home for your friends and family to believe! – The Souks of Marrakech: Without a doubt the most colorful and liveliest in Africa, the souks, or marketplaces, are grouped by the different trades and services they offer: the Dyers, the Blacksmiths, and the Babouche (slippers) & shoemakers, spices, and fabric sellers etc. They’re nicknamed the “Kingdom of the 5 Senses” for their perfumes, colors, sounds, touches, and tastes. Tons of photographs to capture here as the joyous rush of locals and visitors only adds to the “show”. – Discover Hidden Sights of the Medina: A traditional public hammam (turkish bath), traditional oven, and a Foundouk (old hostel for travelers and their mounts). *Notice: Payment online incurs 3% processing fee (automatically added to shopping cart). Please MAIL CHECK to avoid fee.